WordPress now powers a staggering 20% of all websites on the internet, that’s over 60 million websites! Nothing else even comes close to this kind of dominance and it’s a great thing for consumers because it means there is a ton of choice out there when it comes to picking a theme for your website. If you’re new to WordPress then you should check out our Beginners Guide To WordPress For Photographers.If you’re up to speed on that then you’ve likely come here looking for some inspiration for your new website. I’ve been using WordPress for about 7 years at this point and I’ve gone through several themes on my photography portfolio site, and tested many more than I’ve ended up using. Since more and more people have been asking about it, I decided it’s time to create a list of my favorite themes. I have a notebook in Evernote where I store interesting themes when I find them, or when I find photographers using them and it’s just busting at the seams now so let’s take a look! Bonus – Get A Free eBook! What are the best plugins for photographers? How do I troubleshoot plugin issues? There’s a few quick things I want to mention before we delve into the themes. A special note about Graph Paper Press Themes – Get a 25% discount! 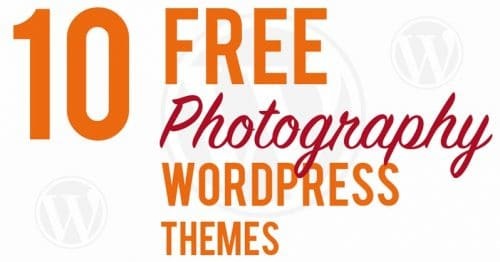 Graph Paper Press probably have the largest collection of photography specific WordPress themes on the market and you’ll find a few of them on this list below. I’ve used GPP themes on several sites over the last few years and I love the simple, clean designs that they come up with. Since I’m always recommending them to readers, we’ve actually been able to set up an exclusive 25% discount code to use on any purchase from them. How cool is that?! What does “responsive” mean when you’re talking about a website? You’re going to see me mention the word responsive when I’m talking about many of the sites on this list. Essentially, responsive means that the website is designed to work on mobile devices as well as your typical desktop computer. We all know how hard it can be to navigate some websites on your smartphone because all the menus just become tiny and the layout is usually far from optimal. A responsive website analyzes the screen size for the device you are using and then serves up a site design that works best. When responsive sites are used on tablets and smart phones for example, they typically feature much larger menu buttons, but when the same site is viewed on a computer, it goes back to normal sizing. This is just one example of how a responsive site makes life easier for mobile browsing but usually there are many more differences as well. 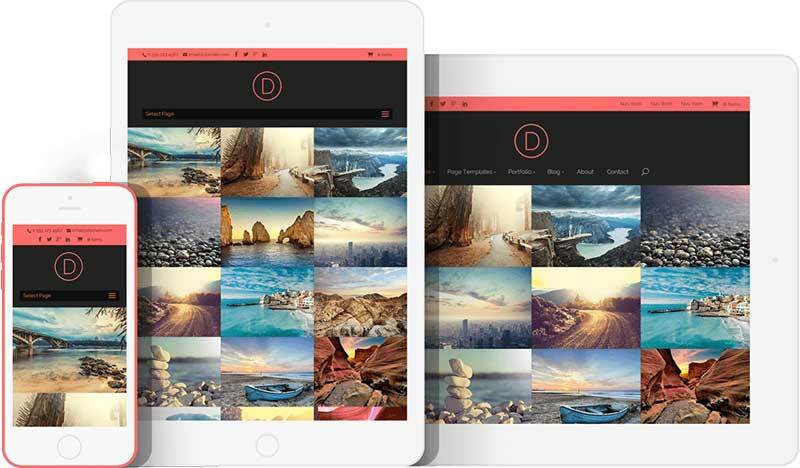 Divi 2.0 from Elegant Themes is a great example of a responsive theme. Right, let’s get down to it! Onesie is a super clean responsive theme from Graph Paper Press that places your content “floating” above a main background image. I love the unique design and it allows you to quickly turn your front page into a stunning gallery. Called Onesie because you can set it up so simply that you only need a one page website if you want, with all your contact details and sample images right there on the home page. Love it! It also integrates with GPP’s Sell Media plugin so you can easily sell prints or stock photography. A single theme from Graph Paper Press costs $79 ($59.25 with our discount), or full access to all 50+ themes is just $149 ($111.75 with our discount). 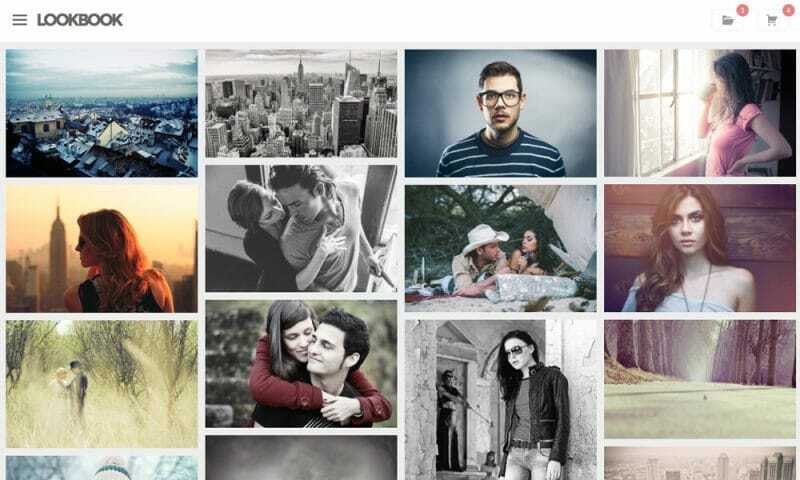 A highly flexible photography specific theme with over 18,000 downloads and they have a great demo page where you can see how people have put the theme to use. 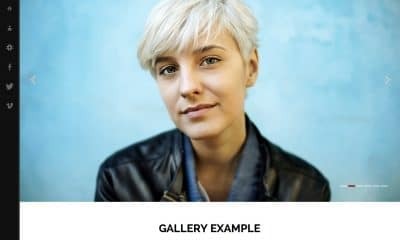 There’s a ton of layout options so it’s quick and easy to make your site look unique and since Photocrati also makes the most popular gallery plugin for WordPress, NextGen (over 10 million downloads!) you can be sure that this ties in very nicely with their theme to produce beautiful thumbnail galleries. If you don’t want to spend too much time coming up with a custom design for your Photocrati site, they provide a large selection of templates that you can upload right away to get you off to a quick start. 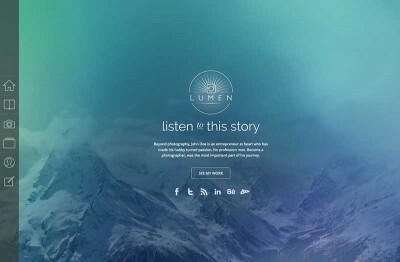 Whilst this theme isn’t designed specifically for photographers it does give you almost infinite possibilities to easily build a stunning looking website. You need look no further than my own photography portfolio site http://DanCarrPhotography.com which is built using Divi 2.0. The key to Divi’s flexibility is the page builder which allows you to use “modules” like construction blocks and arrange them in any way you like using a column structure. For some interesting ways in which you can use Divi’s modules and features I would direct you to my “About” page and also the home page of my site. 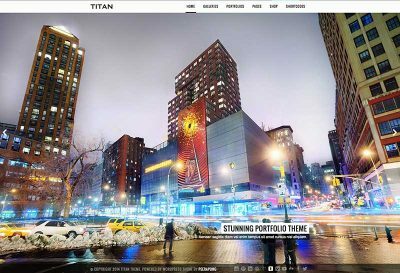 The theme comes with several pre-designed templates, though they are more suited to typical business sites than photography portfolio sites. Nonetheless they represent a good starting point. 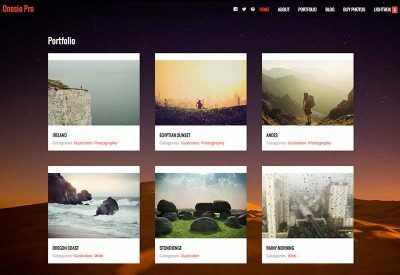 DIVI is a staggeringly powerful platform and offers more features than probably any other theme on this list, but you have to be willing to put a bit more time in to design it is a photography website. With this in mind, it might not be the best choice for someone who is new to WordPress and doesn’t want to roll up their sleeves just yet. In particular, Divi 2.0 comes with a gallery module, but in its current format it’s not suitable for photographers since it crops the image thumbnails in an uncontrollable manner. You would most likely need to add some additional plugins to make this work as a portfolio, such as MetaSlider (which I use) or Soliloquy. Elegant Themes, the company that makes DIVI, has a phenomenal support forum staffed by their own engineers and access to all 89 of their themes costs just $69! It’s hard to find a better deal than that. Litho is a visually beautiful theme available on the Envato Marketplace for $45. The central feature is the full width gallery style that you can see in the image above and it adjusts responsively to fit any device and maintain the images at a comfortably viewable sizing. It comes with two skins, ‘Dark” and “light” and portfolios can be quickly created by adding categories to the “Portfolio” custom post type. I first found out about this Titan when British (but Japan based) photographer Martin Bailey began using it recently and mentioned it on his podcast. This theme really puts your images front and center and it keeps navigational elements well out of the way with a menu at the top and all your social profile links at the bottom. Of course, it’s also responsive, and it looks particularly stunning on a tablet device with those gorgeous full screen images. The whole website is just one big portfolio for your work and it would be perfect for someone who does a lot of dramatic landscape or wildlife photography I think. Probably why Martin chose it! It’s available on the Envato Marketplace for $55. 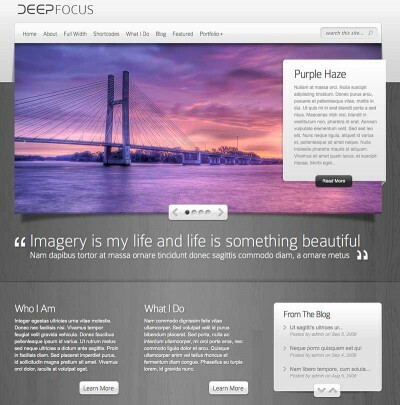 Deep Focus is a super smart looking theme by Elegant Themes. It comes with an image slider for your front page which is great if you don’t want to have to bother installing a separate one as a plugin. One of the main reasons I included it on this list though is simply that it’s a very different design to the others on this list. 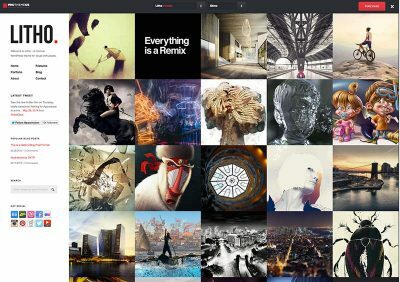 I think it has a very smart ‘business’ look to it, but at the same time offers excellent ways to display your work with the slider and beautiful portfolio gallery pages. Elegant Themes’ built in settings page lets you quickly change all the options you need and you could have this site up and running in less than five minutes. It’s the kind of site I show people, along with Onesie Pro, who don’t have an online portfolio at all and I say to them “look how quick and simple it is to have something that looks professional” ! Get access to all their themes for just $69. 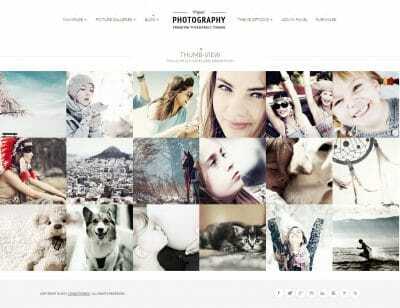 Trail is a full screen responsive theme that puts the emphasis on image, making it perfect for photographers. In particular, I really liked the layout of the blog section on this theme so if you are into blogging about your latest work and adventures then you should definitely take a look at this one. It also comes with a really good looking gallery index. Available from ThemeTrust for just $49. So-called “one page” websites are popular right now with agencies and big businesses. The idea with these is that items in your menu, like “About” or “Contact”, don’t take you to a different page on the site, but instead take you further down the front page to a section that contains that information. So essentially your entire site could be just one big long page at your home URL. The One Page Parallax theme does this very well and whilst it’s not a specific photography theme, there’s enough options there to add a category based portfolio, about and contact pages and for most people that’s all you really need. Choosing this theme will give your site a very modern look. Available for only $13 from the Envato Marketplace. This is one of Graph Paper Press’ newest themes and it uses a stunning responsive “mosaic style” gallery as the front page. The menu is subtly hidden in the top corner which gives your portfolio pride of place, free from other distractions. The mosaic system works with both landscape and portrait orientation images which is VERY important and something that some other theme providers often do poorly. Thankfully Graph Paper Press predominately create themes for photographers so they really know what we want! 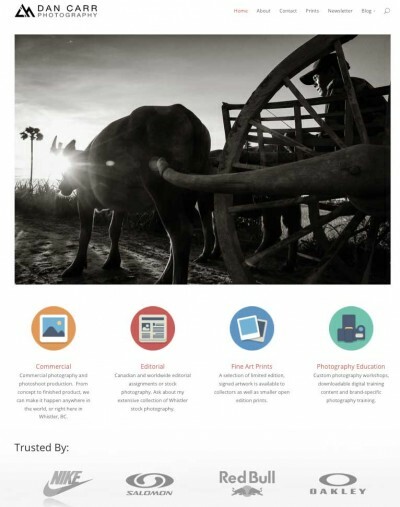 This style of front page will give your potential clients all they need to know about your photography skills in one quick glance. But wait….. this theme also has a trick up its sleeve! There’s a reason it’s called Lookbook! When your mouse hovers over an image in the mosaic you’ll see a save button appear. You can add as many images you like to your saved folder and then the website can automatically create a PDF lookbook for your prospective client to take away with them. Better still, it captures the e-mail address of that potential client so that you can follow up with them personally. LOVE this! E-mail marketing is a much underused method by photographers. 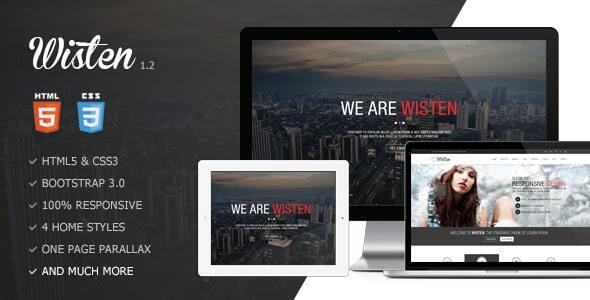 Gleam is full screen theme that allows you to show images in the largest possible way in your portfolio. I’m not such a fan of this theme if you like to blog a lot since the layout of the blog section isn’t to my liking, but if you just want to have a simple site that shows off your photos then it’s worth a look. Invictus is another unique looking photography specific theme. This one features huge full screen image on the front page but it also has an infinite scroll thumbnail bar across the bottom of the screen which gives this a different look to the other full screen style themes we’ve seen already. Available from the Envato Marketplace for $45 and currently sporting a score of 4.5 after over 900 reviews! 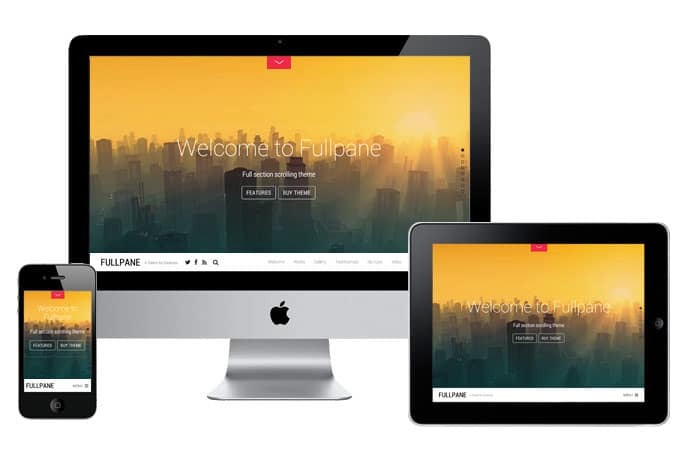 Fullpane is a responsive fullscreen theme with a menu bar at the bottom, yet another variation on full screen portfolio options! Check out the demo here and navigate to the gallery section to see one of the best galleries out of any of the themes on this list, big full screen images with nice big thumbnails at the bottom. A second unique feature of Fullpane is a drop down widget area at the top of the screen. In fact I don’t remember seeing this on any theme before but it provides a great place to put recent tweets, social profile buttons or links to recent blog posts. A wonderfully fast and flashy theme that’s available for $49 on its own, or you can join their theme club for $79 and get full access to all of their themes. 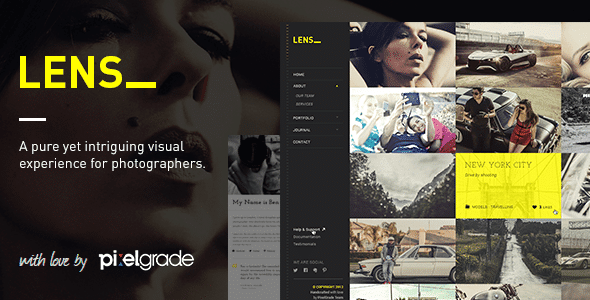 Glare is a photography specific theme that has a large homepage slider and a very elegant overall design that would suit a fashion or wedding photographer in particular. It’s available directly from CSSIgniter for only $39. This bright theme would really suit a wedding or family portrait photographer. It also features WooCommerce integration so you can turn your site into a fully fledged online store to sell prints or products and take credit card payments online. Galleries look great, but importantly for many people, the blog page designs and index pages also look great. 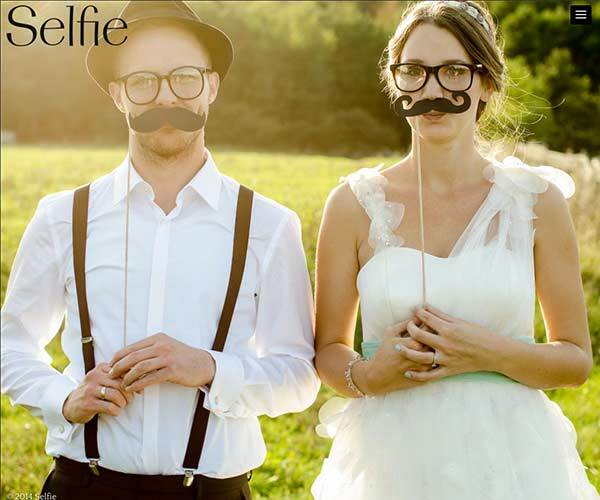 If you are a fan of showing latest images from your recent portrait or wedding shoots then Tripod is a great choice for $55 from the Envato Marketplace. If you don’t want to take part in the race to the bottom of the stock photography market that’s taking place with companies like iStock Photo, you can always start your own stock photography website and set your own pricing and keep 100% of the income by using Graph Paper Press’ Sell Media plugin. The plugin is actually free, though there are some additional paid add-ons for it. Whilst the plugin works with any WordPress theme, understandably it works best when used with Graph Paper Press’ own themes. 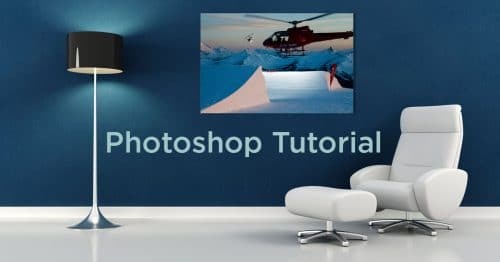 Stock Photography is a theme designed, as the name suggests, specifically for use with this plugin. If you are a specialist in a certain type of photography, or have a particularly large collection of images from an iconic location, then setting up an automated stock sales site might be a great way to make some passive income from your images. You could even set this up alongside your main portfolio site with a second installation of WordPress in a sub-folder, like http://mysite.com/stock-photography. 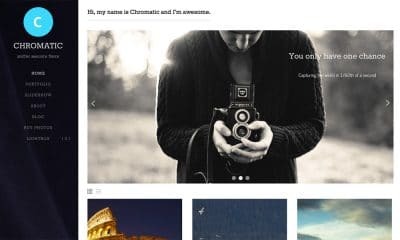 Whilst the Stock Photography theme above is quite specific in its intentions, Chromatic is a multipurpose theme that’s designed to be both a portfolio AND a sales site in conjunction with the Sell Media plugin. The integrated drag and drop image slideshow is a great feature and of course it’s responsively designed as well so mobile device visitors will still be able to enjoy your images and read your stories. The sidebar menu can be hidden at the click of a button to give your images even more screen realestate. 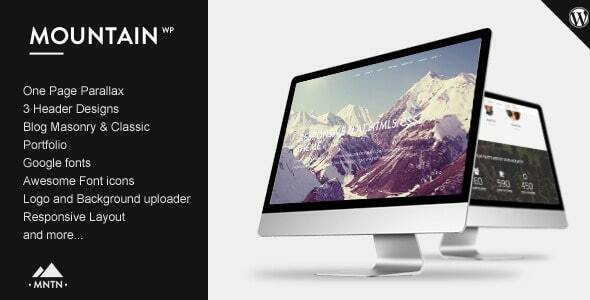 Mountain is a stunning one page flat style parallax theme that’s perfect for a huge variety of photography styles. Each section on the site is customizable so it’s easy to make the site as long or as simple as possible. $40 from the Envato Marketplace. 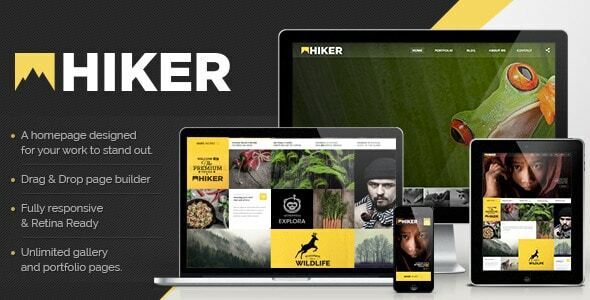 Hiker is a $50 premium theme from the Envato Marketplace that’s again designed specifically for photographers. The fully customizable grid style front page is another variation on full screen designs that allows you to mix and match images along with blog posts and latest projects to create a grid of awesomeness! To really get a feel for the design of this site, more than the others it’s important to click through and check out the demo site because this one is a little tricky to describe how it works. Just know that it is well worth the look if you are looking to create written content along with your portfolio images. Such a unique website is sure to keep you at the forefront of your client’s mind! Another beautiful responsive theme from the folks at CSSigniter, Vignette also allows video backgrounds (see their demo) to make a visit to your website even more unforgettable. Galleries are handled by a large mosaic style layout that pops images up into a lightbox slider for individual image viewing. The blog also features a really wide sidebar which is great for adding in cool widgets like Flickr viewers or Instagram feeds. Priced at only $39. Selfie might just be the simplest theme on the whole list so some of you might find the $49 price tag a little on the high side for a theme that provides only the bare minimum. On the other hand, I include it because I know from past experience that there are people out there who don’t want all the bells and whistles and would actually rather pay for simplicity because in the long run it saves them time! 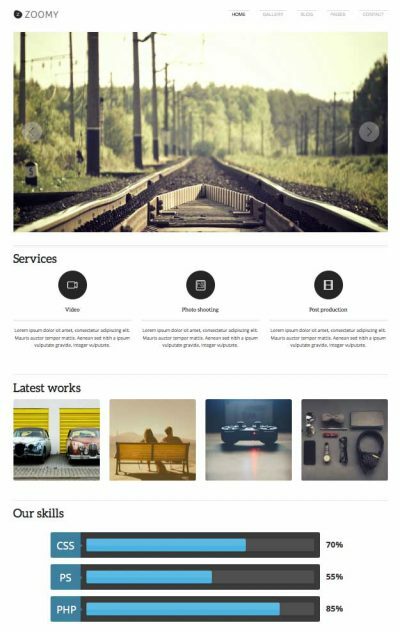 This theme is a simple single page theme that just shows full width images stacked on top of each other with text overlays for things like contact information and your ‘About” section. You could probably have this site set up in under 5 minutes! Selfie is $49 and available directly from Organized Themes. 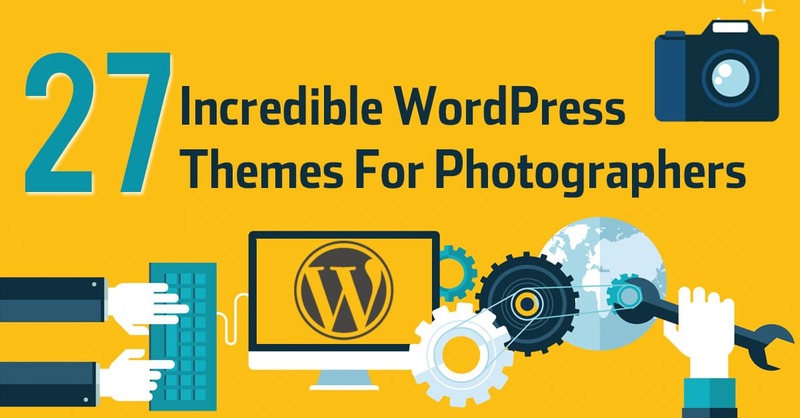 Tesla Themes are making their first appearance on this list with the photography specific theme called Zoomy which only costs $39 (or $54 for all their themes). Zoomy has a very simple flat modern look to it with an excellent blog section as well as some killer features for explaining your particular skills and services to your potential clients. I think this would be a perfect theme for a corporate portrait photographer or anyone else that’s used to dealing with big businesses. It’s one of the smartest themes on this list without a doubt. Yet another different take on the full screen style portfolio site from Hero Themes with their Moda theme. I like to obvious navigational arrows in the bottom corner of the screen that just invites you to start clicking through your images. This theme also benefits from having a nicely laid out blog section with a big wide sidebar for adding all sorts of cool widgets. It comes with 5 different gallery styles, all of which feature drag and drop ordering and you can even password protect galleries for your clients, allowing you to easily proof images from your latest shoot, a features that we haven’t seen natively in any of the other themes. Moda is available from the Envato Marketplace for $40. The Awesome theme from Graph Paper Press takes the large image, full screen idea and adds blog content to the front page with the same design. The top of the front page is a full width image slider but if you scroll down, you are immediately presented with image rich full width blog posts. If you are an avid blogger then you should definitely include Awesome on your list of potential themes. The super clean minimalist design keeps the site fast on all devices and it’s also responsive. The menu is hidden in a slide out left-hand sidebar to add to the clean minimal look. Very slick! You would think that by now we had seen examples of all possible portfolio site types but over on Mojo Themes I came across this cool theme called James 2.0. This one creates an infinite brickwork wall of images, posts and text that you can drag up, down, left and right with your mouse to explore more content and more images. As in the example on their site, I think this would be an excellent choice for a portrait photographer. A really unique take on the brickwork style layout! James 2.0 is available from Mojo Themes for $59. Lens has a lovely flat design to it with a variety of gallery types and a simply fantastic mosaic style blog layout that’s really different to anything else we’ve seen on this list so far. I also really like the default grey/yellow color scheme as well! The portfolio project custom post type allows you to create specific featured sections for image and text heavy project descriptions which are always a great way to show your personal projects or favorite client projects. Lens is available on the Envato Marketplace for $55. 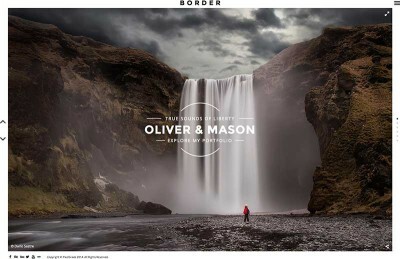 Border is a $55 theme from PixelGrade that really puts your images front and center. It gets its name from the white border around the otherwise full screen images, and social icons plus navigational elements are neatly tucked away in this border area. The result is a clean and simple look that invites the reader to immediately scroll through your best work. A small icon in the top right corner reveals a pop out menu where you can put links to your necessary contact pages and details about your services. The blog layout isn’t my favorite on the list so it might suit someone who isn’t going to rely on blogging as part of their marketing strategy. In terms of a theme for showing beautiful full screen images though, this really is a stunning design that currently has a 4.86/5 rating after over 100 reviews on the Envato Marketplace. 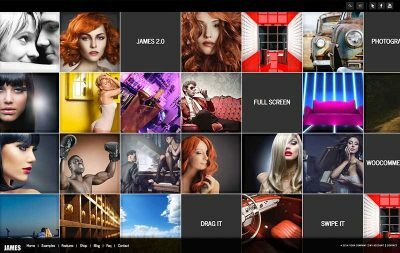 Check out the mosaic style galleries as well for your individual portfolios! Wonderful work from these guys. I hope you found the theme suggestions useful. I’m sure there’s something there for everyone and it’ll save you a ton of time. 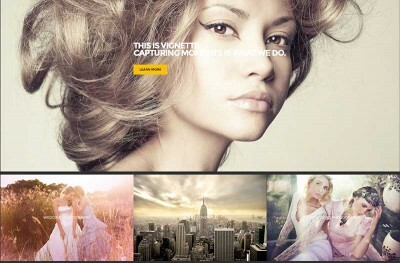 With an awesome photography theme, we need to give it some plugins now to complete the package. 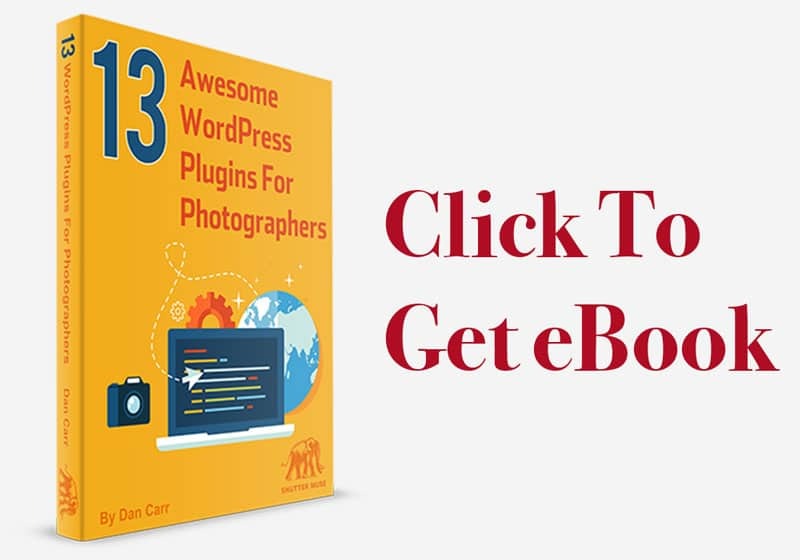 This free eBook walks you step-by-step through the process of installing plugins, maintaining them and troubleshooting their issues as well as detailing what I consider to be the 13 best plugins that you can install on your photography site. What theme are you using? Leave us a comment below! Interesting article and glad I found it. I’m thinking of starting a photography website and still undecided what option to use. I’m a huge WordPress fan but notice many good photographers simply use something like Smugmug and drive traffic to that site using social media. Since I know WordPress and understand SEO it would seem better to try the WordPress theme route. The problem is I can’t decide between the divi theme and one from graph paper press. Having looked at divi it seems amazing and I might buy it to design other websites anyway. However for photography where you want ecommerce element I’m not sure if it’s the best choice. It seems you need to use woocommerce with it and I’m not sure that it has the flexibility when it comes to multiple print sizes etc. I’ve read stories of people struggling using woocommerce for photography sites. For example some say that if each photo has 5 different print size variables you need to enter these for every photo even if all images are charged the same price for a specific print size. Talk of people spending hours adding this info every time they have 20 new images to add sounds offputting. I don’t know much about the sell media extension for graph paper press but I’m hoping it’s easy out of the box since it’s aimed at photographers as a niche. Do you or anyone else have experience they can share? I’d like to use divi but if woocommerce is not able to deal with what photographers need easily I’d use graph paper press instead. Yeah I wish there was a better WooCommerce add on for photographers. You could definitely make it work with some customizations but if you want out of the box functionality then GPP is going to be much easier. Thanks for quick reply. As it turns out seems I can use divi after all as there seems to be a woocommerce extension plugin called bulk photo to product importer. On the reviews for this extension someone states that the plugin saved his life as previously dealing with variations was long winded. If you have been looking at adding ecommerce to your divi site you might want to check it out, seems to get good reviews. Thanks Gary, I wasn’t aware of that so I will take a look. If you use it and have thoughts on it, please pop back and leave a comment again with your experience and also a link to your new Divi site! Thanks for information! 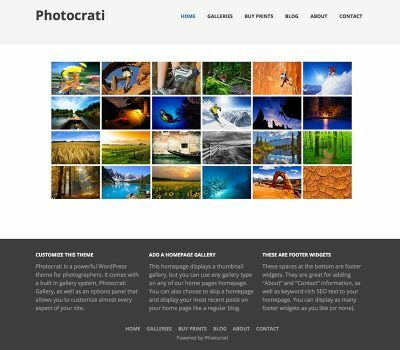 Been using Photocrati but thinking of changing to something responsive. I was surprised not to see Photoshelter here, esp when it comes to selling prints … anyone using it? Cheers Dan! 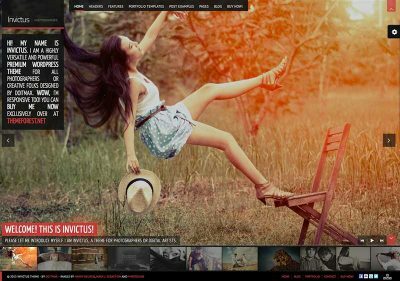 Photoshelter is not a WordPress theme which is why it’s not on the list. It’s a whole platform all to itself. Ah yes that is true! I have used Photoshelter for several years though for client galleries. Pretty good. Far from perfect IMO, but not bad. Thanks for this article. I discovered some interestiung themes. Shared but unfortunately no link for downloading the book appeared. I’m sorry that happened, If you send me an e-mail via the contact form I will send you a link to the book. Thanks! I’ve commented on this post before because I was looking at Divi for a photography site. Whilst I have used Divi for other sites I ended up using Smugmug for a year as I did not have the time to design a WordPress photography site at the time. Still keen to move from Smugmug to WordPress though and have looked at various themes again. I note from a recent Elegant Themes podcast that you now use Extra rather than Divi and wanted to ask you something. I also have access to Extra and liked the look of the design but have never used it on any site after I found that it created huge page sizes. The problem was that the theme used featured images that naturally were large in size but used them in places on the theme where a smaller one would be better. So for example you could have a featured image that was 1000 pixels on long edge and the homepage might have a place holder about 250 pixels wide and the 1000 pixel image would be pulled. Elegant themes admitted as much and I’ve yet to see an Extra site with hompage under about 3MB in size. In speed tests Extra seems to perform much slower and with speed being an SEO metric now I wondered what your take on this way? Did you simply decide the large page sizes were worth it for the look of the theme or have you somehow completely re-coded the theme? I know you are an artist rather than a tech guy so I doubt you would want to recode the theme. I have noted some issues with Extra in that way. They also have some annoyances where you have to use CSS to hide the related posts widget and author box. This means they are still contributing to page load times even when you can’t see them. Here’s the thing, though… since changing my personal site to Extra, I have seen a 16% increase in page views because the site is simply easier to navigate through the archives with all their new archive page designs that you can create. Perhaps the load time has gone up, but if it has then it’s nothing I have noticed, and I doubt it would effect my SEO enough to have a negative effect that isn’t overcome by the recent increases I have seen. So the net result is, for me at least, more page views -> mission accomplished. My home page, which is full of MASSIVE full page images, still scores an 82% “B” rating with the Google Page Speed, so that’s ok with me. If I was more of a developer I could likely bring that down further. Thanks for the quick reply. I’m now at the stage where I will be looking to do my design soon. Not sure I understand exactly what you mean by ‘easier to navigate the archives’ in relation to a photography based website but will do some research on this as I’ve heard that before. I really wanted to like Extra as it looked better if you wanted to use a blog but I just came across too many issues. Interesting that you got such a decent page speed score with it as most people seem to struggle, me included. As things stand today I think I would still use Divi unless I can understand what the real benefit of Extra is. With Divi 3.0 soon to arrive I’m also left wondering which would be the better theme. Could be Divi 3.0 will have the best bits of Extra. It does seem that Elegant Themes are concentrating more on Divi than Extra which is part of the reason why I’m leaning towards that. I think the “concentrating on Divi” is a bit of a misconception and it is totally ETs fault. All the new core Divi features for D3 will be available in Extra at the same time as well. Extra2 is on the way. As for navigating the archives… Divi archive pages are truly awful. On the other hand, then whole point of Extra is the archive pages, so it’s apples and oranges. Thank you for your very useful post here, and for all your work and share. I am thinking to build my own website for Photography and I am exactly at the moment to look for a theme corresponding the most of what I would like to do (presentation of my photos and videos, blog, shop… mainly) … I am hesitating between Divi3.0 and Kleo themes (SevenThQueen). As you did not select Kleo (http://seventhqueen.com/themes/kleo/) in your list I wonder why and I would like to know if you have an idea on it? 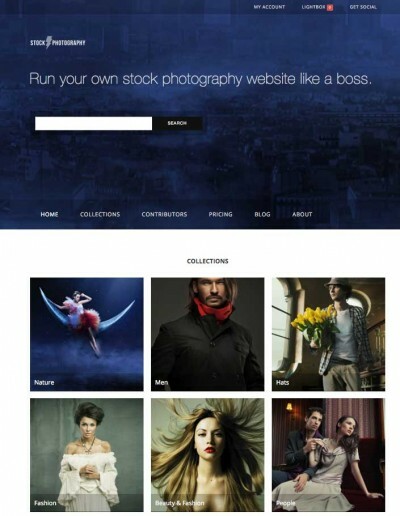 Don’t you think that Kleo could not correspond to a good photography website theme ?